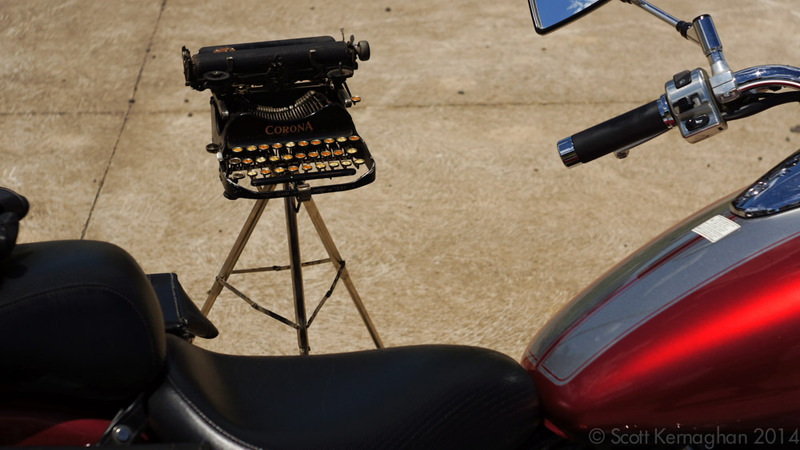 The Corona 3 tripod is an accessory to which most typewriter collectors probably need no introduction. 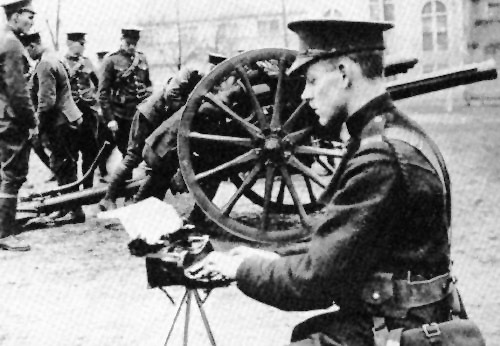 The above image of a Corona 3 on its tripod in use by a Canadian soldier during the first world war is probably one of the first photos most of us have ever seen of this often talked about accessory. 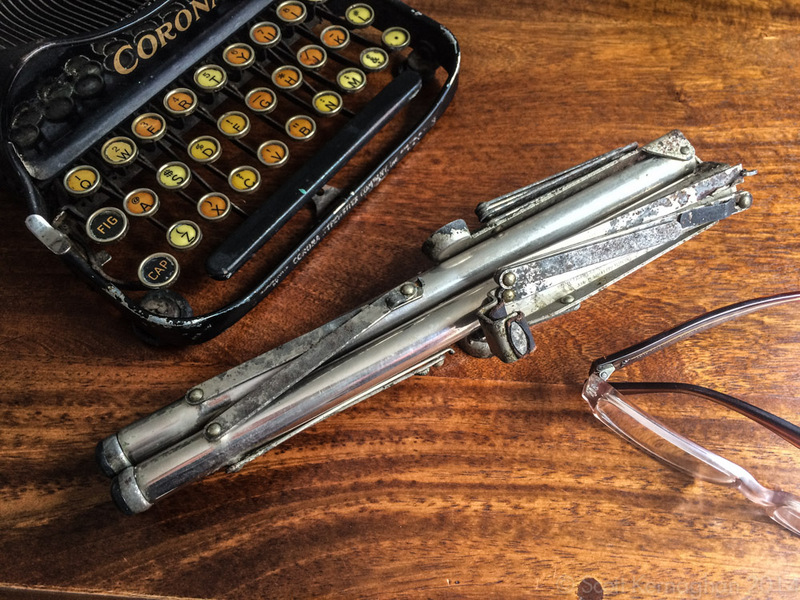 It was first produced at by Corona typewriters back in 1916. 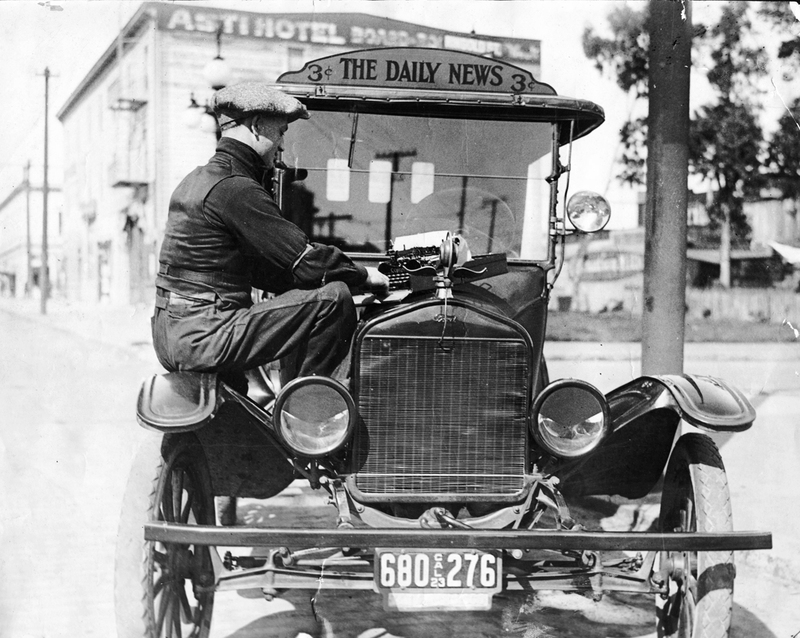 It sold for $6 additionally to the typewriter, and is estimated to have been sold until sometime between 1921 and 1922. There are no versions advertised for the Corona 3 ‘special’ or the early Corona 4. Corona advertised the tripod could be used everywhere – and suggested all kinds of possible locations, such a typing on a train or in a park. And if you are so inclined, you can even type on one right next to a cannon – if that’s your kind of thing. Ahhhh cannons. Is there anything you can’t do right next to one? I was browsing Australian eBay a few months back when I spotted something odd pop up in my ‘typewriter’ search. 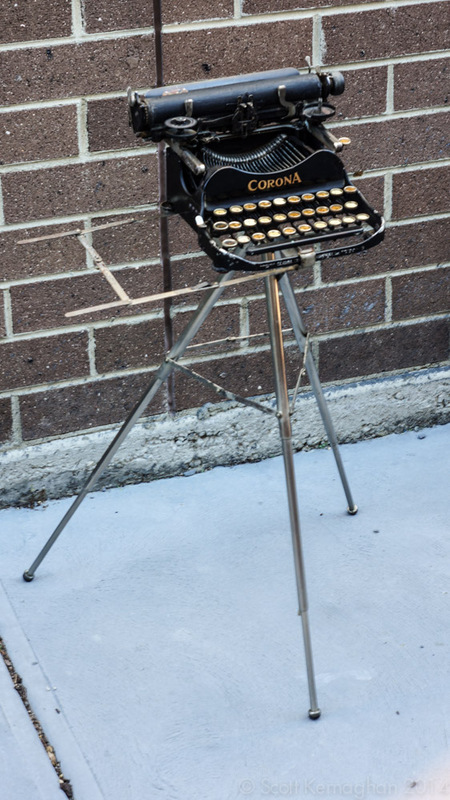 It was described as a ‘Typewriter stand made by Corona’, and featured a set of blurry photos that looked like a heavily rusted piece of garbage. 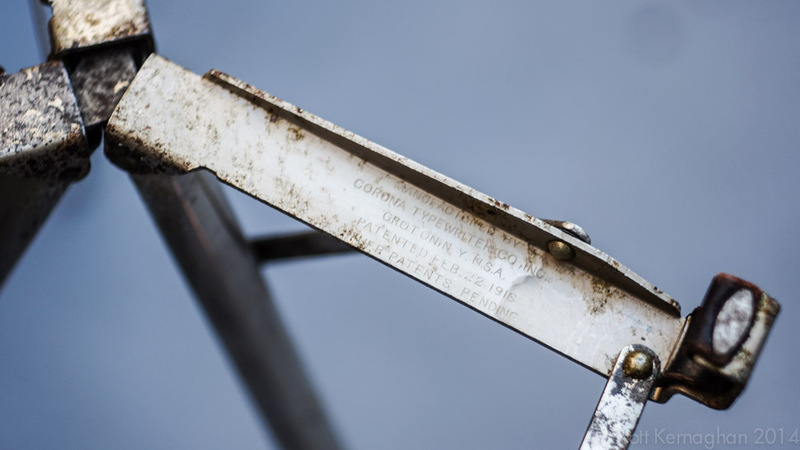 The seller had made a vague attempt at opening this ‘stand’ up to show prospective buyers, but it just ended up looking like a twisted piece of heavily corroded steel. It didn’t seem to match the look of the graceful Corona 3 tripods I’d seen in a couple of photos in the past. None the less I threw a bid at it, and won. I was only bid against by one other typospherian – Natalie Tan – and I ended up taking the ‘stand’ home for less than the price of a couple of pizzas. 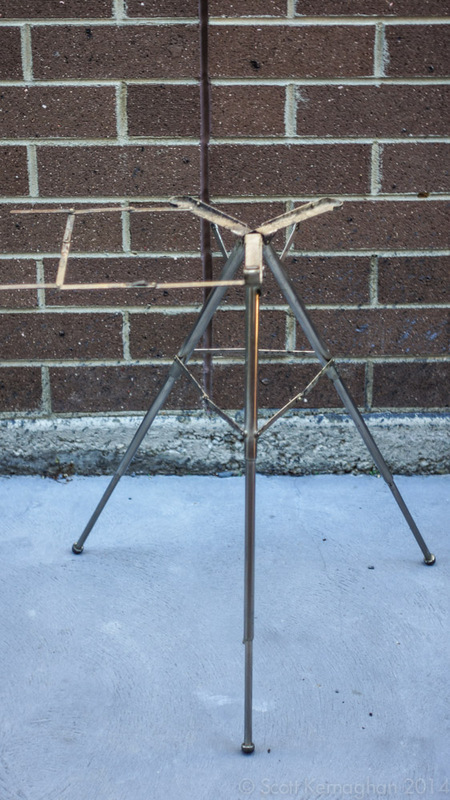 I didn’t bid much as I thought that the Corona 3 tripods were pretty common, and that even if it was one, I’d probably come across a better example sometime in the future. After about a week it arrived and had been nicely bubble wrapped and stuffed into a large envelope. I tore off the wrapping and discovered that it was indeed a Corona 3 tripod, and then set about cleaning the tripod up. It looked pretty shabby alright, but it was more dirty than rusty – and as such it cleaned up well. With a bit of oil in a few key places worked perfectly and I grinned with joy when I finally got it fully open and set up properly on my garage floor with a Corona 3 on it. Unfortunately I only had a Corona 3 parts machine on-hand to give it a try with, as most of my other machines are still in storage after the move from Queensland so I haven’t really had a change to try and type on it as yet. But it feels very sturdy and stable. The tripod in its folded state. At this point I have to concede something. When I bought this I knew absolutely nothing about the Corona 3 tripod or its history, and especially of its status as a collectable. Maybe if I read Etcetera I might have known more, which has prompted me to think that it may be time to subscribe. Aware if my ignorance I popped online and did a bit of a search to see if I could find which other bloggers had these in their collection, but I came up empty-handed. Of course I found a partial history of the design of the tripod on the Oz Typewriter blog, and about a 100 copies of the photo of the Canadian soldier writing on one. But outside of the Chestnut ridge museum site and two online typewriter museums, I found absolutely nothing other than a bit of chatter about the tripods on one of the yahoo typewriter forums. The Corona company produced a number of special accessories for the machine, such as the label holder (pic 6) and a special tripod that allowed the machine literally to be used in the field. The tripod also had a foldout section on the side for copy or notes. This tripod is very rare and the value exceeds that of the actual machine many times. Hey? I just bought this thing on ebay barely contested, at a price that is much less than most of the typewriters I have purchased. So with that, I popped an email off to Richard Polt – who I thought would surely know if this was bulldust or if I had just enjoyed my moment of sheer dumb luck for the year. Richard in turn put me in touch with Peter Weil, who has an extensive knowledge of all things Corona 3 related. I asked Peter a few questions, and he confirmed that it was more of a case of dumb luck. I also asked him if he knew how many other tripods there were out there, and he said he never knew how many Corona ever made in the first place and could only offer a guesstimate on how many still survive, along with how many may be in the hands of collectors. Peter mused that the “Corona # 3 tripods are and always were fairly rare, especially from 1920 on“, but debated that they are as sought after by collectors as the museum pages suggest. While there’s demand for them, it only takes two people bidding on ebay at a time to push the price up – which is usually exasperated by the infrequency that they are listed on ebay, which allows the seller access to a larger market. Unless of course you happen to be selling on ebay.au and nobody is looking at that particular time. But lets face it. Who needs a Corona 3 tripod if you have the hood of your car? Photo supplied by Peter Weil from his collection. 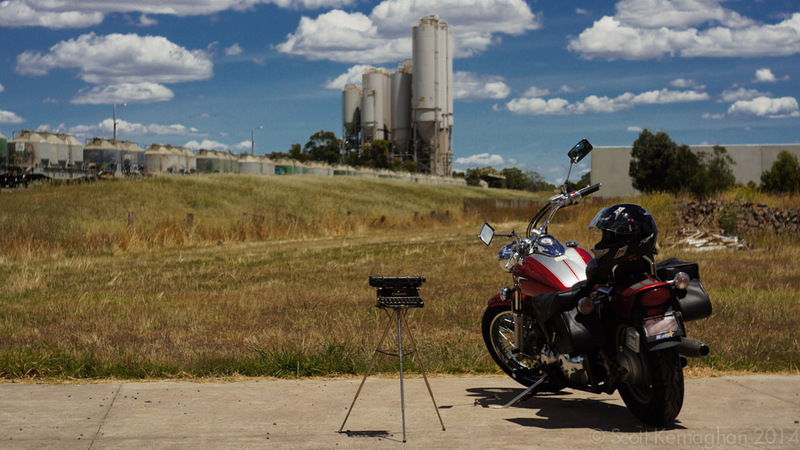 Oh wait… I can think of a great on the road use for my Corona 3 tripod. Yeah! This is a machine made for travelling. Corona 3 and a motorcycle? I think that’s a perfect on the road writer’s match. Just use the bike’s saddle as your seat, and viola! The design of the tripod is surprisingly strong. The tubular sections are made with nickel plated brass, and the rest is nickel plated steel. Some of the plating on the steel on my tripod has flaked, which has allowed some of the steel to rust. But generally the tripod is in complete and serviceable condition, and is ready for use. Which is pretty amazing for a 98 year old piece of hardware. As you can see the tripod’s paper holder is folds out to left hand side. This holder actually splits in half and folds away in two sections. From what I can tell, a lot of examples of these tripods have lost the small tab that partially locks the two halves together, which seem break off easily and as such leaves the two halves somewhat hanging. 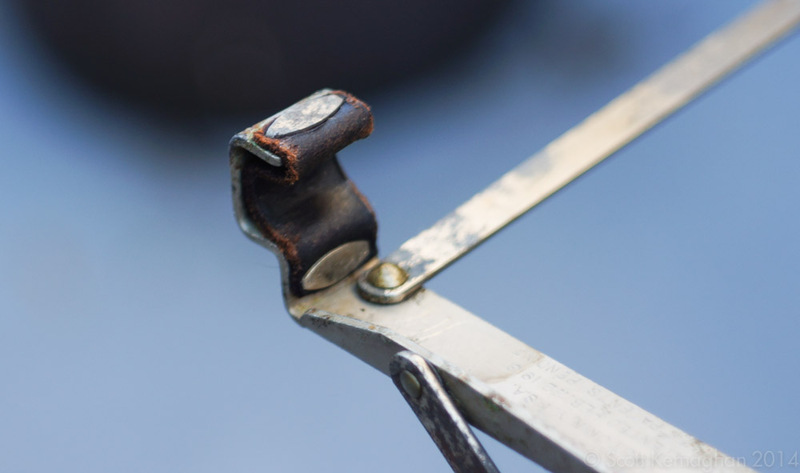 This small piece of metal seems to be the most likely to break piece on this typewriter, as it still remains quite exposed when the tripod is folded up. The feet are made of rubber, and in the case of this machine largely un-worn or distorted. Another surprise when I got this typewriter was that this example still has the small leather tab that was attached to protect the front of the typewriter from getting scratched up by clasp at the front of the typewriter. 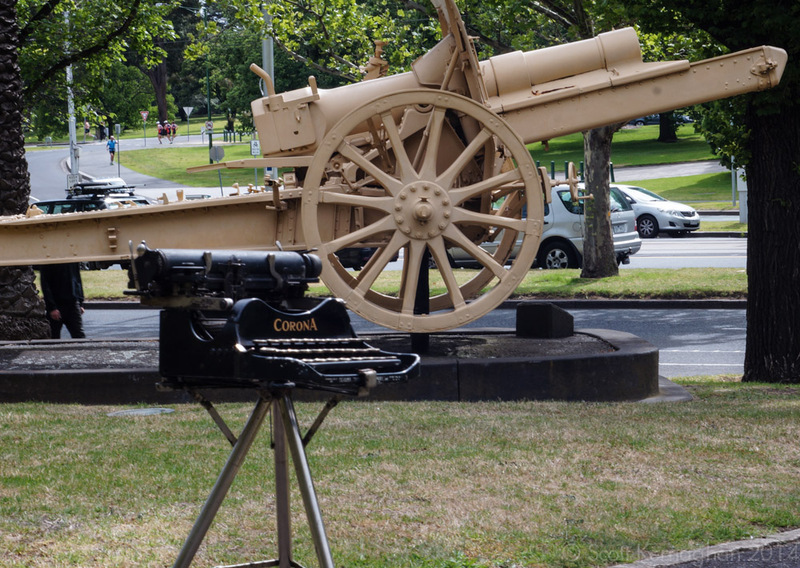 In every example I have seen of these online so far (including the Australian War Memorial’s own tripod) this piece has been missing – although in some cases it may have just not been visible. If there was ever any doubt that this was an original Corona tripod, the etching inside of one of the arms quickly dispels any doubt on this. This is also where you are able to find out if it was the earlier (patent pending) 1916 version, or a version made post 1917. All in all this is an impressive little device for the Corona 3. While it doesn’t quite suit the direction of my collection, I think it is going to be a wonderful addition. That said, this device is old, and grabbing hold of another one probably isn’t going to happen again in my collecting lifetime, so I’m probably going to have to be a little bit reluctant to take this out on the road as my travelling typewriter stand. That said, I’ll do a full write-up sometime soon about using this tripod, and how well it works. So keep an eye out for that! Hmm… I wonder how hard it would be to produce a 3D printed replica of this device. Thank you everyone for continuing to read and comment on my blog. It’s been fun writing the last 200 posts, and I hope to continue to do more – as well as improve the quality of my posts. Thank you. Thank you very much. Not so much dumb luck as fortune favours the brave – I remember that tripod coming up on my typewriter search and deciding to pass on it, not having the stomach for the bidding war I expected to ensue. All’s well that ends well though – I couldn’t have restored it as well as you have. Weil I like to thank you for 200 posts and giving me something interesting to read. Very good find and a wonderful way to mark your 200th post. that is a darn nice score – and congrats on post 200! I have one of these. Have you noticed that the front of the Corona 3 (accompanied by the tripod) that goes into the leather tab is slightly narrower than on the other Coronas 3? I hadn’t noticed that. I have tried it on a few different ones and they fit without any issues, and my understanding was that it had been sold separately. I am curious though.